One toss under the lights and you'll know why it's name is the Diamond Show. 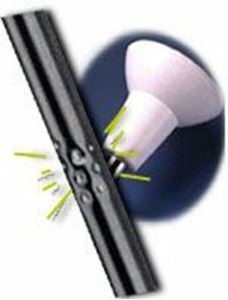 It's not only beautiful, but its precision indicators can instantly help a performer, who has lost control or is blinded by the lights, to locate the middle reception part of the baton. Precision twirling instruments with outstanding twirlability, designed to meet the demands of today's champion twirlers. Available in every inch length from 16" through 30"